When I was younger I liked to smoke a big cigar during celebrations, such as Christmas, New Year and Birthdays. I gave up smoking nearly twenty years ago, but I'm lucky enough to have the odd chocolate cigar during celebrations nowadays. It's just finding a decent one can be a bit of a chore. However, Cinabar found this Smoky Papua New Guinea milk chocolate cigar, flavoured with smoked sea salt and Lapsang Souchong tea, on her latest holiday in Chester. I unwrapped it as a nice surprise with my Christmas presents. Packaged in a metal tube reminiscent of my cigars of old, this chocolate cigar was much easier to get into than others I have tried in previous years. Usually they have been wrapped up in oodles of paper, foil and sticky backed plastic so much so that you are lucky to find a whole cigar after unwrapping. This was just a screw top and away you go! The cigar itself had a generous dusting of cocoa and ground Lapsang Souchong. I'd recommend not eating it whilst wearing anything white or over a white tablecloth. 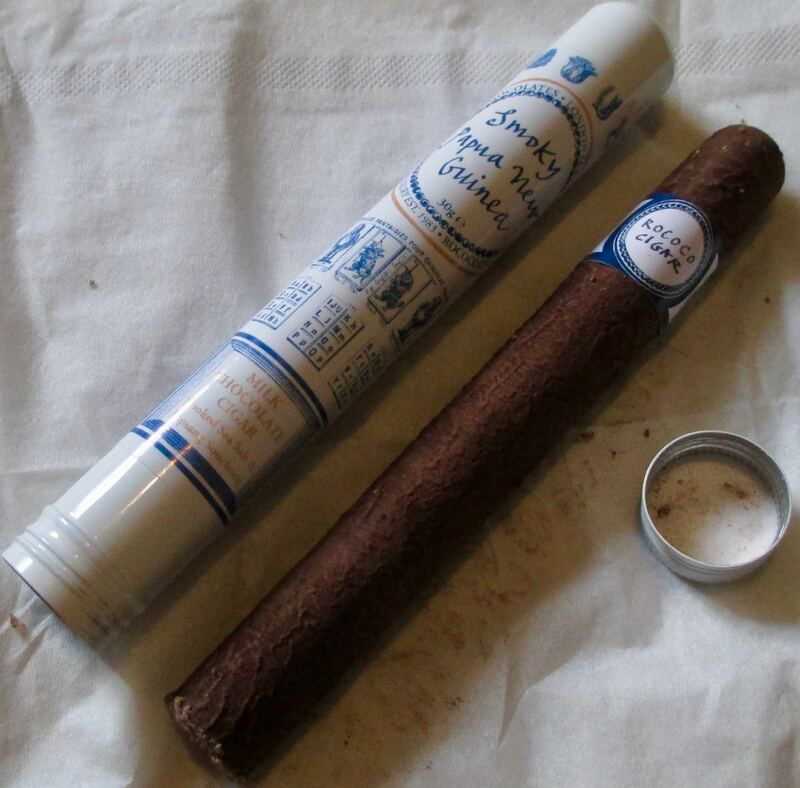 Like many real cigars it had a printed label ring around the puffing end. After peeling the paper ring off and receiving a liberal dusting of cocoa and ground Lapsang Souchong on my fingers, and also reminding myself not to light the other end, I took a bite. This is a crunchy cigar. It would take probably as long to lick it to nothing as to smoke a real one. I couldn't help but eat it. There is crunchiness here. With added granules of sea slat, bits of rice and biscuits there is a host of complex flavours mixed in with the heavy appreciation of milk chocolate and caramel, with cocoa and Lapsang Souchong rounding off these flavours with their own seal of approval. Just like the paper ring label and the smart metal container. Perfect.